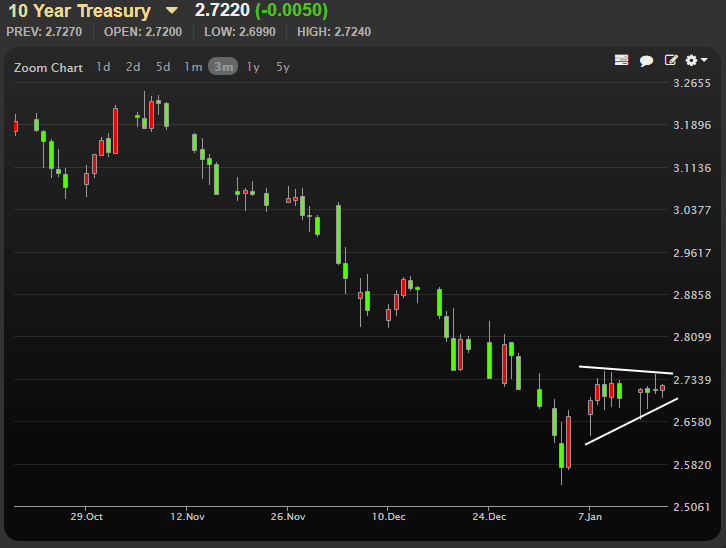 "Treasuries are in a classic holding pattern as we await further clarity on a variety of fronts. The government shutdown remains front and center, if for no other reason than the dearth of economic data the closure has created and mounting concerns the stalemate will impact the real economy." It can't be said with much more clarity. Even if we want to argue the shutdown, itself, isn't a major market mover, it's nonetheless playing a huge role in keeping bond markets range-bound. That range is becoming painfully obvious by the day. These consolidative lines might have to be bumped back out if the shutdown continues into next week, but it wouldn't change the fact that overall momentum is best thought of as sideways until further notice. Housing Starts data will not report today due to the shutdown, leaving us with only Jobless Claims and Philly Fed to set any sort of data-driven tone. Beyond that, keep in mind that bond markets are closed on Monday, so trading could get much slower as we approach the weekend. The approach to a 3-day weekend tends to be sideways by default, but with increased sensitivity to imbalances between buyers and sellers. In other words, if a bunch of corporate deals hit the market, it could have a more negative effect on bonds than it otherwise might.